dren accounted for 34% of such variance. The findings were discussed and recommendations made. robbed by feeling of dissatisfaction among teachers. ries. Motivational theories are divided into two categories. M. N. ISAIAH ET AL. morale were also considered low, indicating low self-esteem. lieved to cause job dissatisfaction. The second group of needs is the motivators or satisfiers. absence create job dissatisfaction (Owens, 1995). The expectancy theory was popularised by Vroom (1964). as personality, skills, knowledge, experiences and abilities. itself is not a dispositional variable. tions: Expectancy, instrumentality and valence. provides the foundation for this study. 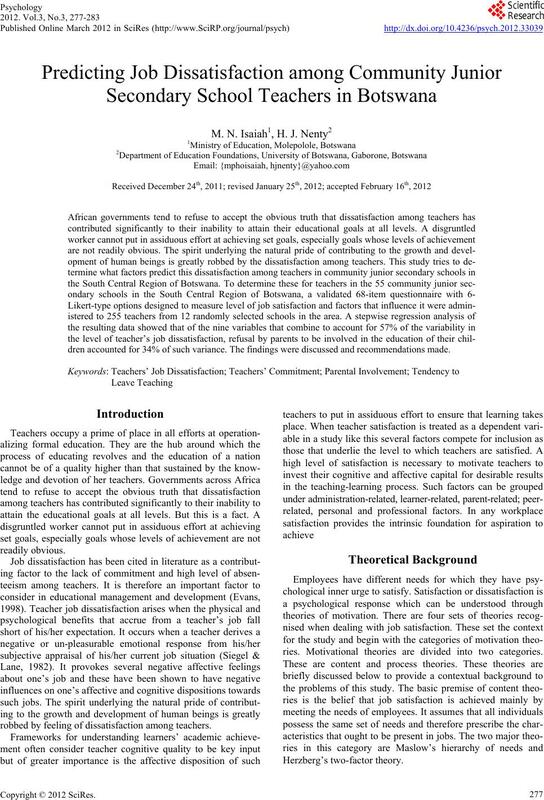 ministrative factors influencing teachers’ job dissatisfaction. 17) And level of adequacy of salary. 17) Level of adequacy of salary (4 items). the entire population of 2,244 teachers in the region. cant at beyond .01 level. to the prediction of dissatisfaction among teachers. job that would satisfy their conscience. have limited recognition of their effort. tribute to the current bad behaviour exhibited by students. Critical t = 2.58 for α = .01. 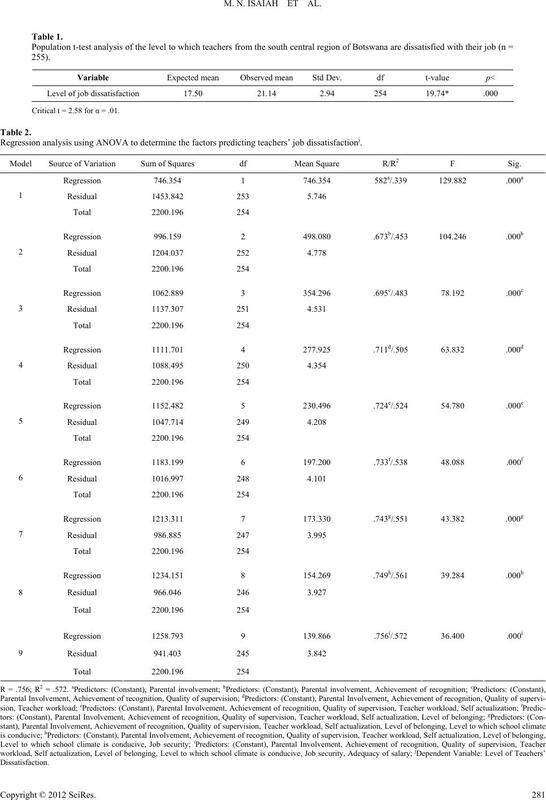 Regression analysis using ANOVA to determine the factors predicting teachers’ job dissatisfactionj. Model Source of Variation Sum of Squares df Mean Square R/R2 F Sig. and frustrated with the conditions of service in the schools. opportunities, salary and many other predictors. tion among teachers at junior secondary school. solute authority which cannot be questioned by his subordinates. sulted in a sense of powerlessness and hence dissatisfaction. to teach and derive satisfaction by so doing. xas Center for Educational Research. URL. Clearinghouse for Educational Facilities. URL. Education. South African Journal of Higher Education, 12, 19-35. Charlwood, A. (2002). Why do non-union employees want to unionise? tisfaction. 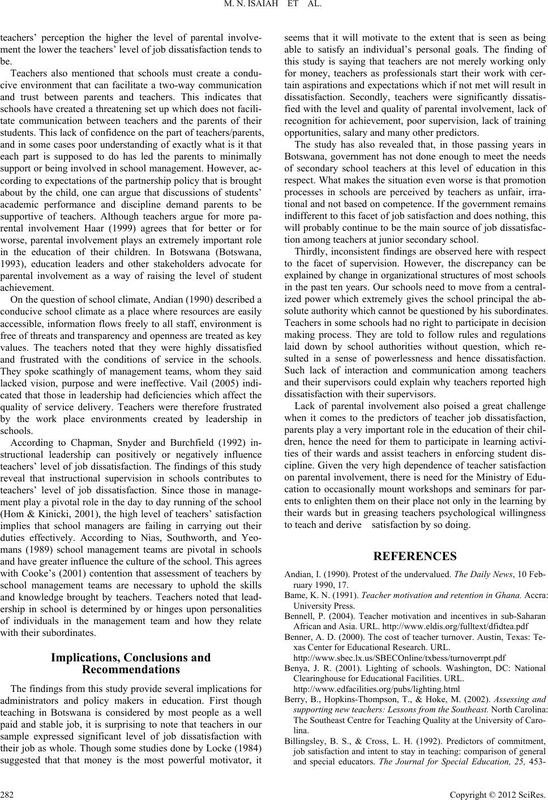 Education Administration Quarterly, 62, 453-478. Evans, L. (1998). 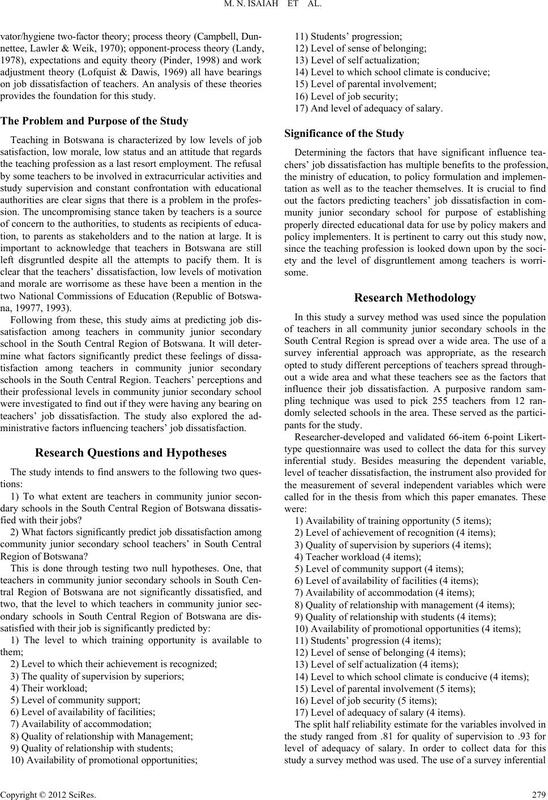 Teacher morale, job satisfaction and motivation. afford to ignore it. URL. Haar, C. (1999). Teacher union and parent involvement. URL. Holtz, G. (2002). How to prevent teacher burnout. URL. sis and wrong prescription. NASSP Bulletins, 86, 16-31. Katcher, B. L. (2003). Benefit pros express growing job dissatisfaction. Employee Benefits News, 17, 9.
perspective. Educational Studies, 18, 201-222.
tion. Newspaper Research Jou rna l, 20, 20-28.
school climate. EDRS, Accession Number ED387853. education. Ministry of Education, Gaborone: Government Printer. logy. Homewood III: Richard D. Irwin, Inc.
sociation, San Antonio, January 1994. Teacher Recruiting. (2005). 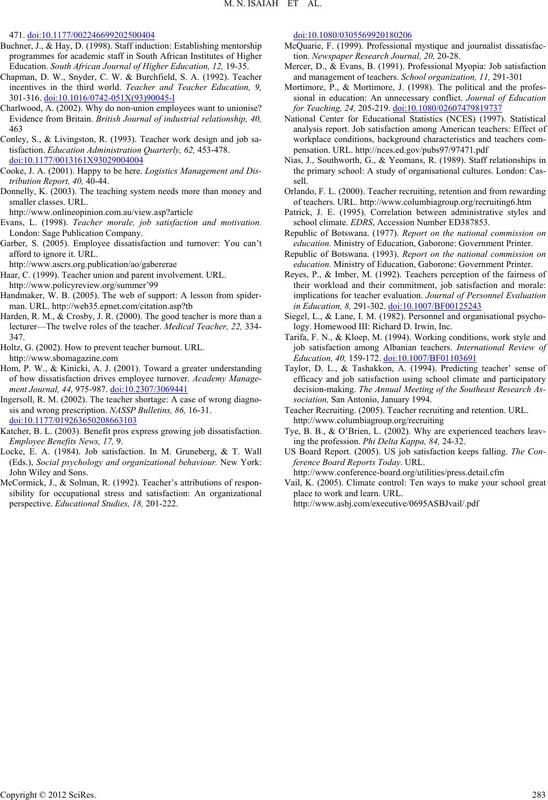 Teacher recruiting and retention. URL. ing the profession. Phi Delta Kap pa, 84, 24-32.
ference Board Reports Today. URL. place to work and learn. URL.